A not so creative liberal fantasy. Dan Rather “got it right” in his 2004 story about President George W. Bush’s avoidance of National Guard duty, a hit piece discredited because of Rather’s reliance on forged documents, the President of the imaginary “UBS News”cable channel will declare in an upcoming HBO drama helmed by left-wing writer Aaron Sorkin. Halliburton and Dan Rather. 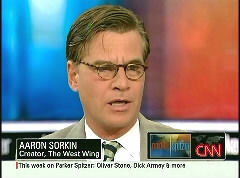 Sounds like Sorkin is channeling the imaginations of Chris Matthews.